We would like to assist families that love and care for their dog or cat to be able to bring them home. We understand that a sudden unanticipated expense of $150+ (reclaim fee + Spay/Neuter cost) creates a hardship and often families do not have the ability to quickly come up with the money to get their pet out of Animal Control. In addition, we would like to help low income famalies with the cost of spay/neuter to help keep the pet population in check. Lack of spay/neuter is the primary reason there are so many cats and dogs at Animal Control in the first place. 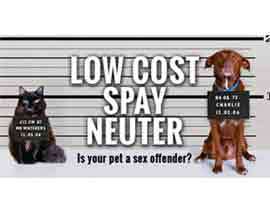 We will primarily assist with low cost spay neuter by donating to great organizations such as the Animal Welfare Alliance that focuses exclusively on this effort. From time to time we will also directly subsidize families in need.